I can’t believe I’m saying this, but I’m calling it now: the Galaxy S6 is the top contender for Phone of the Year. Why? Well, Samsung really overhauled the way it makes phones. I was seriously impressed with it at first sight—the only other phone that’s managed that kind of visceral reaction out of me was last year’s HTC One M8. With its pristine metal and glass chassis, the Galaxy S6 is evidence that the company has finally figured out that premium phones should look and feel premium. It’s fast, powerful, battery efficient, and quite frankly it’s one of the best Android devices I’ve ever used. Samsung had to do something to turn around all the negative press surrounding its slumping sales over the last year—so it started back from square one. It overhauled the garish TouchWiz interface, beefed up the hardware, and crafted a device that every Android phone should strive to be. Samsung’s flagship devices are typically as costly as Apple’s iPhones, even with the carrier subsidy. But the Galaxy S4 and Galaxy S5, with their plasticky bodies, didn't look or feel like they were worth it, despite their powerful specs. The Galaxy S6 is one stylin' phone. The Galaxy S6 is the first flagship from Samsung that I’d actually pay full price for. It’s light, but not too slippery, and it’s thin, but not flimsy. It also looks eerily familiar. iPhone users are going to have a field day drawing up Galaxy S6 and iPhone 6 comparisons. Frankly, I think it’s smart for Samsung to pull its inspiration from the best selling smartphone in the U.S. Not everyone wants the locked-in Apple experience, so why not offer a phone that resembles the one their friend is always bragging about? 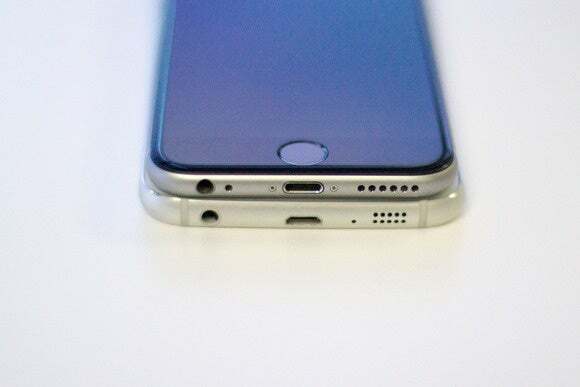 Anyway, it’s only the white version of the Galaxy S6 that really resembles the iPhone. Samsung kept all its usual trimmings on the Galaxy S6: a Home button, two capacitive navigation buttons ("back" on the right, "recent apps" on the left), and a volume rocker on the upper left edge with a power button on the right edge. 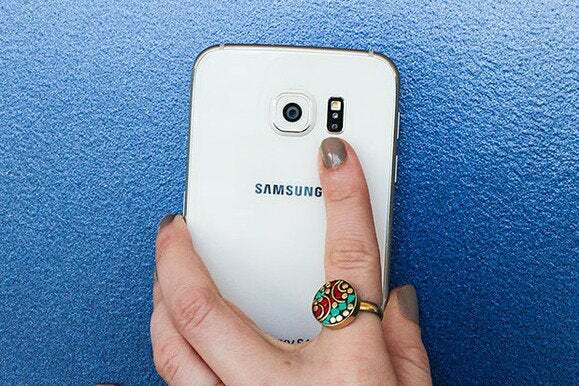 Samsung improved the fingerprint scanner embedded into the Home button so that all you have to do is hold your thumb over it to unlock instead of swiping. It really works far more quickly and reliably than the old one. The rear-facing heart-rate monitor also functions as a flash or shutter button. There’s also a heart rate monitor embedded next to the camera lens where the flash is located. It's more accurate this time, but even if you never take your heart rate, it's useful: it can function as the shutter button for taking selfies. The Galaxy S6's Super AMOLED display seems more muted this time around, but it's really because of TouchWiz's color palette. Samsung equipped the Galaxy S6 with a vibrant 5.1-inch Quad HD Super AMOLED display. It’s got a pixel density of about 577 pixels-per-inch, much higher than the HTC One M9’s Full HD display and even higher than the LG G3’s Quad HD display (as that screen is 5.5 inches). The high resolution display isn’t that bad of a battery sucker, either. I’ve always liked Samsung’s Super AMOLED displays, despite the intense contrast and saturation. I didn’t notice as much of that this time around, however, though that’s most likely due to the fact that the color palette on the TouchWiz interface has been drastically toned down. Samsung said that the Galaxy S6 is more visible in daylight, but I didn’t see it in the bright California sun—I mean, I quite literally still couldn’t completely read the screen, even with the brightness turned all the way up. It did do much better in the shade, however. The phone’s 64-bit Exynos 7 Octa 7420 is fast. Seriously fast. The pared-down TouchWiz interface helps improve responsiveness, and there’s no longer that brief second of lag you used to get when you drag down the Notifications shade. 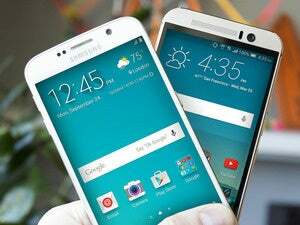 The Galaxy S6 smoked both its predecessors and the HTC One M9. The Galaxy S6 did especially well in PCMark, which tests the device as a whole, based on everyday activities like photo editing and video playback. 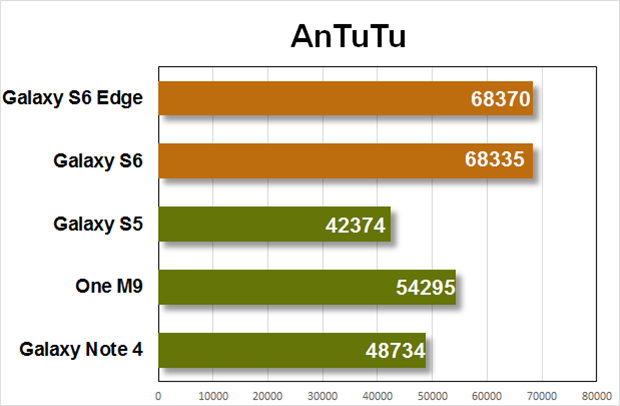 The Galaxy S6 beat out the HTC One M9’s Qualcomm Snapdragon 810, as well as its predecessors, the Galaxy S5 and Galaxy Note 4, in both AnTuTu and PCMark benchmarks. It’s hard to ignore those numbers, especially since this is the first time Samsung’s bundled its own homemade Exynos chip inside a high-end U.S. device. 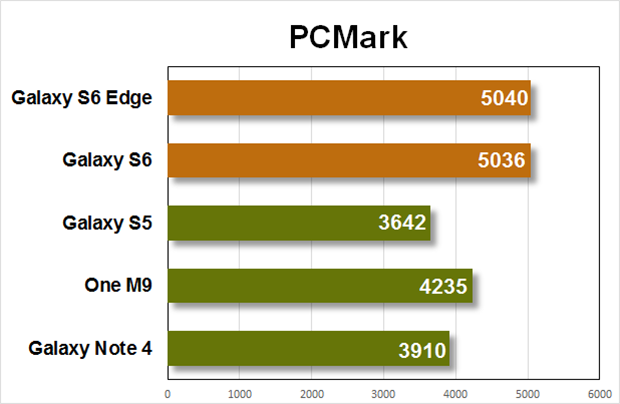 If you’re looking for the full, in-depth rundown of the Galaxy S6’s performance, be sure to check out our seperate benchmark results article. I’ll be revisiting those scores in about six months to see how well the Galaxy S6’s processor holds up over time. The Galaxy S6 is comfortable as a phone...you know, its intended purpose. 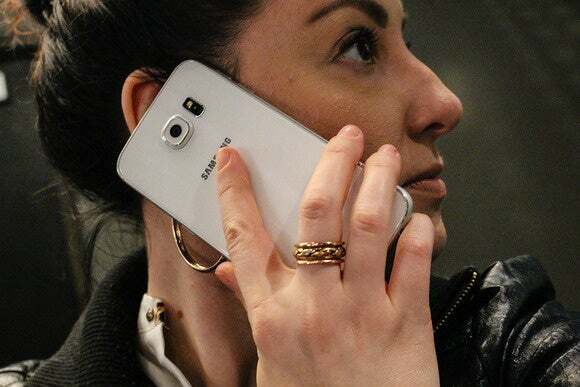 If you make a lot of phone calls, the Galaxy S6 is comfortable to hold for extended periods of time, though it does get a bit warm the longer you leave the screen on. Keep in mind that it’s easier to hold with your shoulder if you have a case on, otherwise it slips right out. There’s one particular area where the Galaxy S6 still falls short: sound. Samsung equipped its flagship with a bottom-facing mono-speaker that’s capable enough for talk radio, podcasts, and watching videos, though it starts to strain when it pumps out music at full blast. It certainly sounds better than last year’s Galaxy S5, but I’m hoping Samsung can figure out a way to pack in stereo speakers that rival the HTC One’s in its next device. 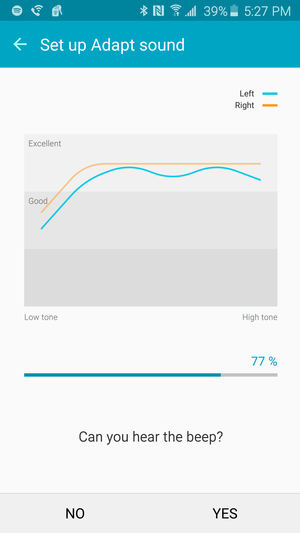 The Galaxy S6's calibration app, available in the Settings. At least it sounds nice with headphones on. 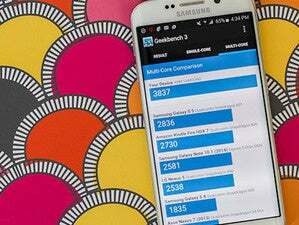 The Galaxy S6 comes with neat audio tuning software that can calibrate even the cheapest pair of headphones to sound bass-y. Finally—here’s an Android phone with a camera that’ll make you put away the point-and-shoot you’ve been carting around on family vacations. I’m incredibly impressed by what Samsung has done with the Galaxy S6’s 16-megapixel camera. Rather than increase the megapixel count, the company focused on refining improving speed and quality. A few test shots, from left to right: one outside, in the shade, one in the bar, and one out at dusk. The camera shooting experience has gotten better. The interface on the camera application is more straight forward for novices, but enthusiasts also have complete manual controls available. And the camera app pops open in a split second with a double-tap of the Home button—perfect for grabbing a quick selife. The Galaxy S6's double-press to launch the camera is seriously the best new feature on the device. The video quality is also impeccable, even in a dim bar setting. I filmed my friends and I singing karaoke and I was surprised at how clearly I could see of them. The image stabilization is quite impressive, as well. I held the phone while shooting a MUNI Metro train rolling by and it was so steady, it almost looked like a cinemagraph. I was delighted with the Galaxy S6’s low-light performance, too. It’s the best I’ve seen on any Android smartphone thus far. I sincerely hope that the company keeps this up for its future phones. You can see the full rundown of the Galaxy S6’s new front- and rear-facing cameras here. The Galaxy S6 is one of the most battery efficient Android flagships I’ve used in a while. Its 2550 mAh battery pack may not be as big as the Motorola Droid Turbo’s, or even last year's Galaxy S5, but for a flagship with a Quad HD display it seems surprisingly capable. The Galaxy S6 has a stellar battery life. 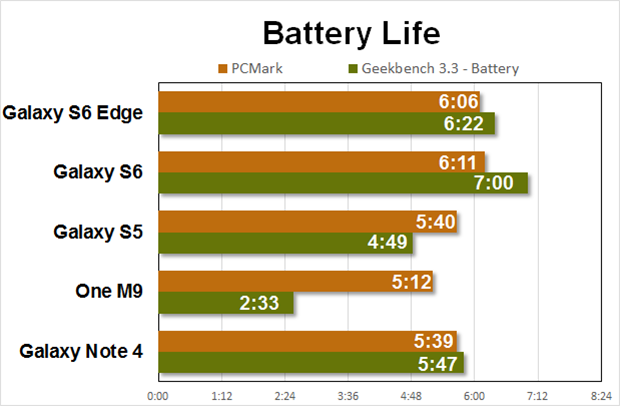 The Galaxy S6 lasted a full 7 hours in our Geekbench battery rundown test, and about 6 hours and 11 minutes in PCMark’s battery test—impressive results for a high-end phone. In the real world, it’s just as long-lasting. I used it to navigate around the Bay Area, snap photos of my friends, and peruse Twitter all day long. On standby, the phone basically hibernates, lasting forever. With the screen on and the brightness cranked up, it burns through the battery quickly. You don’t have to hate TouchWiz anymore—though I don’t blame you if you’re still irked by the fact that Samsung skins the heck out of Android. I’d rather Samsung just ditch the skin and go for stock Android with some software tweaks, à la Motorola. TouchWiz on the Galaxy S6. TouchWiz is definitely much better than it’s ever been. It’s lighter and a little more grown up, though Samsung still held on to some annoying nuances like the blue-hued Notifications shade and cramped Quick settings. I like the stock Android Lollipop design for Quick settings in the Notifications shade and I wish that Samsung would have adopted that instead. Themes are nice, but not as customizable as you'd like. TouchWiz has Themes now, which is cool, but it doesn’t work like other theming engines: you either choose a whole theme, or none at all. Samsung’s current selection of themes is quite limited, but we're assured lots more is on the way soon. Who likes extra apps? Because Samsung's bundled them. As I noted in my TouchWiz walkthrough, there’s still some bloatware to deal with—and you can’t even delete it entirely. The Galaxy S6 comes with a few Microsoft applications right out of the box, like Skype and OneNote, in addition to applications like Instagram, Facebook Messenger, and WhatsApp. You can’t delete any of those, only "disable" them. There’s also Samsung’s suite of apps, including Milk music, Milk video, a voice recording app, and My Files, as well as whatever bloatware your carrier’s bundled in. You’ll still have to set Google Chrome as your default, too, and put Google Photos front and center to keep Samsung’s Gallery app at bay. As a seasoned Android user, I’ve accepted that overlays are par for the course, but I’m secretly waiting for it to go out of style. The good stuff can stay; I love Samsung’s Multi-window functionality, and the fact that you can dismiss every open app at once from the multitasking screen. But the added apps are just useless, and I think Samsung would have been better off partnering up with Google to offer storage with Google Drive instead of 100GB with Microsoft’s OneDrive. Is this it? Is this really the phone of the year? I hope that what Samsung did with its camera in the Galaxy S6 sets the precedent for the way the company does design and manufacturing from here on out. Focus on simplicity, quality, and real-world performance over "big number" specs and tons of features. Samsung is starting to take these principles to heart and the result is the best phone the company has produced in years—the best Android phone anyone has produced in years. The company still has some work to do reducing bloatware (or at least making it truly optional) and streamlining its interface, but this is a much better state of affairs than it was last year. The Galaxy S6 has it all: beauty, brains, and power. If you’re due for an upgrade, get the Galaxy S6. No phone is perfect, but this is the best we've used in a long while, and thus it deserves our highest rating. There is no other Android phone that will satisfy your needs as much as this one. It’s certainly fulfilled mine. This story, "Galaxy S6 review: Samsung's glorious return to greatness" was originally published by Greenbot. With its stellar camera performance, powerful processor, and gorgeous metal and glass chassis, the Samsung Galaxy S6 is one of the best phones money can buy.